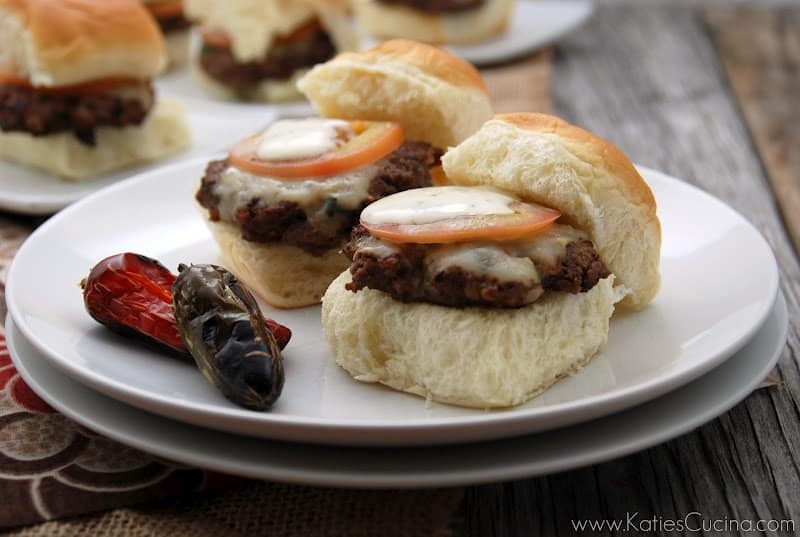 I know what your probably thinking… sliders? 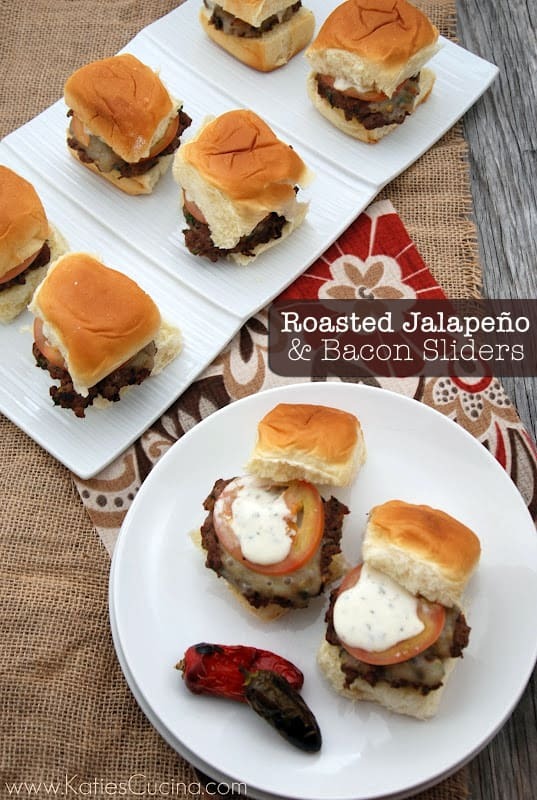 Jalapeño & Bacon sliders? Where is the bacon you might ask? It’s mixed in the ground beef! That’s where it is at… hidden like diamonds in a mine. Yep, I just went there… I just compared bacon to diamonds. I was inspired to make these sliders thanks to the abundance of jalapeños I have right now. If you’ve ever grown jalapeño peppers you know that they can be abundant. You’ll have more jalapeños than you’ll ever desire to eat off just one plant. And if you let them sit on the plant longer they turn red just like a bell pepper. The red jalapeño pepper is a tad sweeter than the green. Preheat your grill to high, clean, then place two small jalapeño peppers on the grill and roast for 5-10 minutes, turning a few times to get a good char on it. Remove from the grill, lower the temperature of the grill to low heat. Place the jalapeño peppers in the refrigerator to cool. While the peppers cool, in a large bowl add lean ground beef, white onions, parsley, season salt, chopped bacon, and garlic. Remove the jalapeño peppers from the refrigerator, remove stem and seeds if you want to keep the heat to a minimum. Finely chop jalapeños and add to the mix bowl. Mix well, but be careful not to over mix. Make 8 meatballs from the mixture. Once you've made the meatballs begin to flatten them down to hamburger patties. 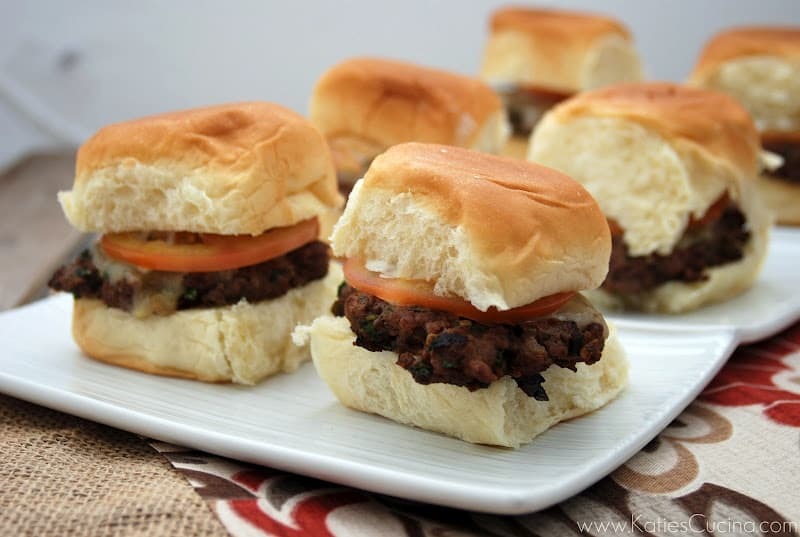 Remember, we are making sliders so you want them small. I like to really flatten out the pattie since it tends to bulk up once on the grill. Place the beef patties on the grill, cook for 3 minutes on each side. During the last minute of cooking add the pepper jack cheese, and add the King's Original Hawaiian Sweet Rolls to the grill to give them a light toasting. Remove the patties and sweet rolls from the grill. Assemble in the following order: Bottom of sweet roll, beef pattie, tomato slice, ranch dressing, sweet roll top. Enjoy! Bacon and diamonds are one in the same in my book! I’m seriously considering asking for the former from my future fiance 😉 These look delicious! I love adding jalapenos to my burgers. Whenever we go to Five Guys they’re part of my usual order. I don’t make burgers that often at home but the next time I do I’m definitely giving these a shot! ooh, these sound fantastic! we also grown our own jalapeños, so this would be a great use of ’em. yum! Oh, these are amazing! We would gobble these up in no time at my house!